My name is Nazimah, and I'm a Malaysian doctor working in the UK. When it comes to clothing, I will opt for a comfortable, easy-going, travel-light style. I am not very fussed about what I am wearing, as long as it maintains modesty, is affordable, colourful, and nice for me to look at, then it's ok. I dress for myself, hence, if I like the reflection I'm looking in the mirror, that is my style for the day. I love jeans with a tunic top or dress with a cardigan. They are comfortable, and I can run for the bus/train/plane if I need to (and mind you, this happens a lot when I'm travelling!). I also go for long skirts if I feel girly that day and the weather is not too cold and windy. I think I am a very practical person too, and so backpacks are the best when traveling, but recently I found that large handbags are extremely useful. I love colours, and I think the 'cherry on top' with wearing hijabs is that I can match (or sometimes purposely mismatch) the colour of my dress with my headscarf, and this can bring statements to my attire for certain occasions. I feel it's an obligation for me to celebrate the colours of God's creation too! There are no rules in fashion - so I promote creativity in choosing what to wear! I think Muslimahs should not stop themselves from doing things they love because of hijab. 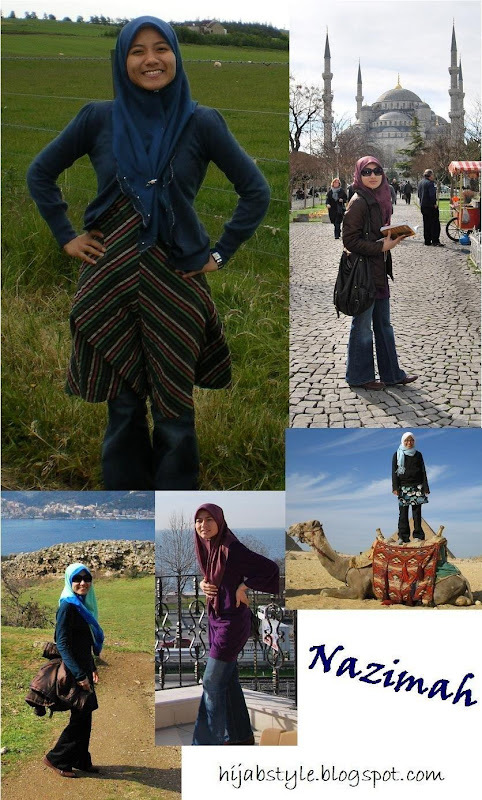 If you feel like travelling the world, yes you can strut the world wearing hijab. If you feel like hiking mountains, then wear your hiking shoes, smother sunblock lotion, don't forget the colourful hijab...and off you go! I do this all the time, and I can assure you it is a lot of fun! aw mashallah i love her! i love your style and it look sporty too which im a fan of! Yeaayy. Way to go Nazimah!